We carry Ceiling Mounts and Accessories, too! The perfect kit for adding extra security to your mounting solution. 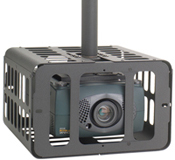 This security anchor is the perfect way to turn your projector's NPT pipe into a security anchor point. Seamless, aircraft aluminum construction.